Direct-to-consumer (DTC) genetic testing services such as 23andMe and Ancestry.com are rapidly becoming a cultural touchstone, a mainstream phenomenon with significant implications for common notions of race and ethnicity, personal and social identity. 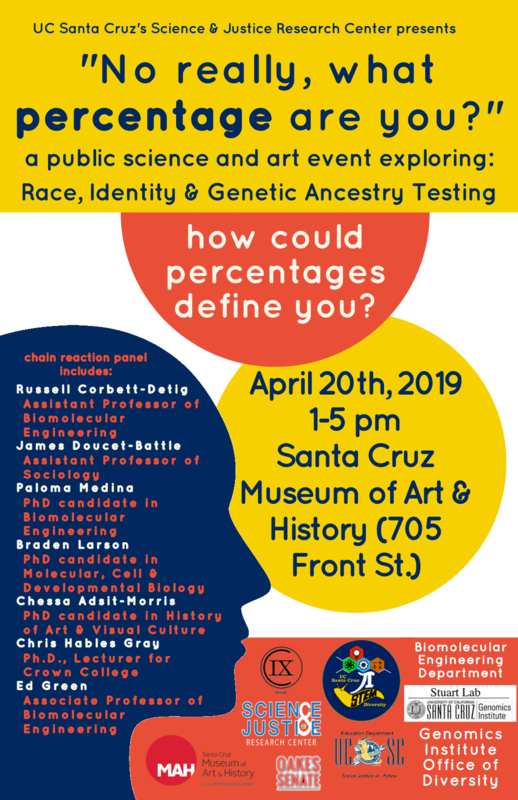 Our public event will explore the promises and the problems of DTC genetic testing services, under the broader umbrella of racial justice and genomics. We will explore questions arising within this new landscape of public genomics: How are people integrating genealogical knowledge (such as of their family tree) with new forms of DNA-based ancestry testing? What is the relationship between our genetic makeup and our racial and ethnic identities (and the ways we are racially classified)? What kinds of genetic ‘truths’ are being produced by these forms of commercialized science? Further, who owns, and has access to, our genetic data? What kinds of organizations are using our data, and for what purposes? We will engage both science and art to creatively grapple with questions of race and ethnicity in this age of data-driven identities. Our event will host an art exhibit on genomics and identity; an interactive collage-making session; and an experimental type of panel called a chain reaction in which professors and graduate students working in this broad field will converse in a semi-structured conversation through a chain of dyads. Jon Akutagawa (Biomolecular Engineering), Dennis Browe (Sociology), Maggie Edge (Literature), Dorothy R. Santos (Film & Digital Media) and Caroline Spurgin (Education) with undergraduate fellow Diana Sernas (Mathematics). If you feel that genetic ancestry testing has benefited or impacted you in some way, please inquire and send anecdotes to Dennis Browe. The UC Santa Cruz Science & Justice Research Center, the School of Engineering NIH Training Grant, College Nine Student Senate, the departments of Biomolecular Engineering, Education, and the Genomics Institute Office of Diversity, Oakes College Senate, and the Stuart Lab. Posted in Grad Fellows Event, Upcoming Events and tagged Genomics, Identity, Race.